A group of Canadian diplomats is suing the country’s government for C$28m ($21.1m; £16.4m) after they succumbed to a mysterious illness in Cuba. The group of 14, including diplomats’ family members, says Ottawa took too long to warn, evacuate and treat them. Last year, Canadian and US officials were recalled from Havana after complaining of dizziness and migraines. The cause of the illness is unknown, but Canada has discounted the idea of a “sonic attack” on its embassy. “My wife, she isn’t the same anymore,” one unnamed diplomat told Canadian broadcaster CBC. According to CBC, staff at the Canadian embassy began experiencing symptoms of the so-called “Havana syndrome” in spring 2017. 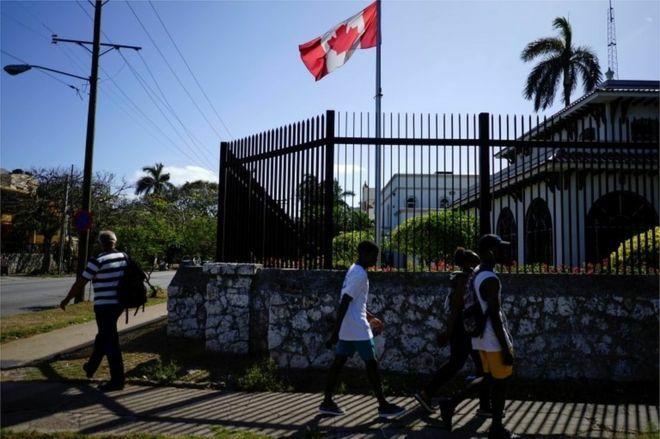 Several families were subsequently moved from Havana, but until April 2018 Canada continued to post new staff to Cuba despite warnings from US counterparts who had received similar complaints. The US withdrew most of its non-essential personnel from the country in September 2017 and said 21 embassy employees had been affected. Last month, Canada said it would be cutting its embassy staff by up to half. At a news conference in Washington, Canada’s Foreign Affairs Minister Chrystia Freeland said she was aware of the lawsuit. Cuba has repeatedly denied any involvement in the incident. The country’s Foreign Minister, Bruno Rodriguez, said US claims were a “political manipulation” aimed at damaging bilateral relations.